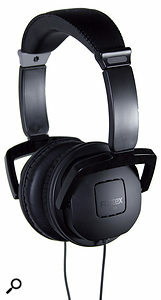 Fostex TH5BB studio headphones.The latest additions to Fostex's TH range of headphones are two models that are targeted at professional studio applications, yet very affordable. The TH5BBs and TH7BBs are almost identical in appearance, with a reasonably lightweight plastic frame and padded leatherette headband and earpieces. Emerging from these earpieces is a 1.5m captive cable which terminates in a mini-jack; an extension cable with a full-sized quarter-inch jack is supplied, and seems to mate pretty reliably with this. They're not the most comfortable 'phones I've ever used, but once I'd got used to them, I had no problem wearing them for long periods. 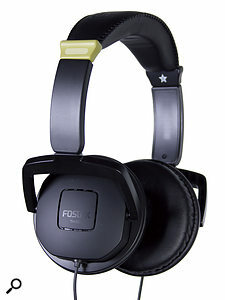 TH7BB.Fostex describe the TH range as "semi-open” headphones, perhaps in reference to what seems to be some sort of square venting arrangement on the outside of each earpiece. Any difference from conventional closed-back design is not very apparent in use, however! In fact, one of the main strengths of these phones is their impressive control of leakage, which is better than most closed-back designs, though not quite in the league of models like the Sennheiser HD25-IIs that are designed with isolation as a primary concern. From a sonic point of view, I was not very taken with the cheaper TH5BBs, which have an overblown, one-note bass and a dull top end. The TH7BBs have a somewhat more balanced response, although the bass is still quite lumpy, and the sibilance region is a little too prominent for my tastes. I wouldn't want to mix on either, but the TH7BBs, in particular, are easy to drive loud, reasonably pleasant to listen to and, as already mentioned, offer very decent isolation. At the price, those qualities will make them a useful addition to many studios and location rigs. TH5BB £43; TH7BB £52. Prices include VAT.